Helps distribute your time equitably amongst students. See the tracks of your teaching and monitor student growth. Helps you determine next steps with each student, small groups, or the whole class. Some people keep weekly status of the class forms while others keep detailed notes about every student. It doesn’t matter how you choose to keep as long as you have a system that informs your instruction and is useful to you. If you’ve never kept records inside of a conferring toolkit before, you have a choice to make before you get started. Will you keep notes on paper or will you use technology to type up your notes as you meet with students during independent writing time? I tabbed a spiral-spine notebook, so each of my students had equal space in my notebook. I stored the notebook inside of my conferring toolkit, which I housed in a zippered binder, like this: http://bit.ly/1M68TQw. It was sloppy. No one could read it. But no one had to since my notes were for my own use to monitor and track student progress. Once I left the classroom and began leading presentations on conferring with teachers, I updated them my forms so they’d look slicker. (Click here or here to see these forms.) While handwritten notes worked for me when I was in the classroom, I don’t think I’d go back to them again since I have become comfortable with digital record-keeping in the past two years. Click on the image to enlarge a coaching conference record I typed directly into Evernote. You’ll notice there’s also an audio file embedded in this note. NOTE TO COACHES OR CONSULTANTS: Evernote is a fabulous place to store your conferring notes since it syncs with your smartphone and computer. It cuts down on the amount of paper you will need to carry from classroom-to-classroom or between schools. I could use Evernote exclusively — using Cathy Mere’s incredible system — but I found something that works better for me. I use KustomNote, in conjunction with Evernote, while I am in the midst of a conference. I find it helpful to have the structure of a KustomNote template (I have built separate templates for small group strategy lessons and 1:1 conferences.) to type in while I’m meeting with students. Because I’m in multiple places, having a template that prompts me to record the student’s school and grade level helps me with the kind of record-keeping I do as I travel around to different classrooms. Here’s a search I did for a student I’ve met with a few times. When I search by her name in Evernote, I not only all of the notes I have on her, but I also see thumbnails of photos I’ve taken of classroom charts I’ve used or of her in-progress work. Go to Evernote and sync. The note appears in the pre-selected Evernote notebook. From there I can tag notes, add photos of student work, and/or audio clips of a conference with a student. Some folks might be unfamiliar with KustomNote. (I know about it thanks to Jodi Mahoney.) So, here are a couple things to help get you started if you’re considering using KustomNote in conjunction with Evernote. Here’s what the same note looks like on my Evernote Desktop. Second, if you’d like a 1:1 conference template to get you started with KustomNote, click here to view a public template I created. 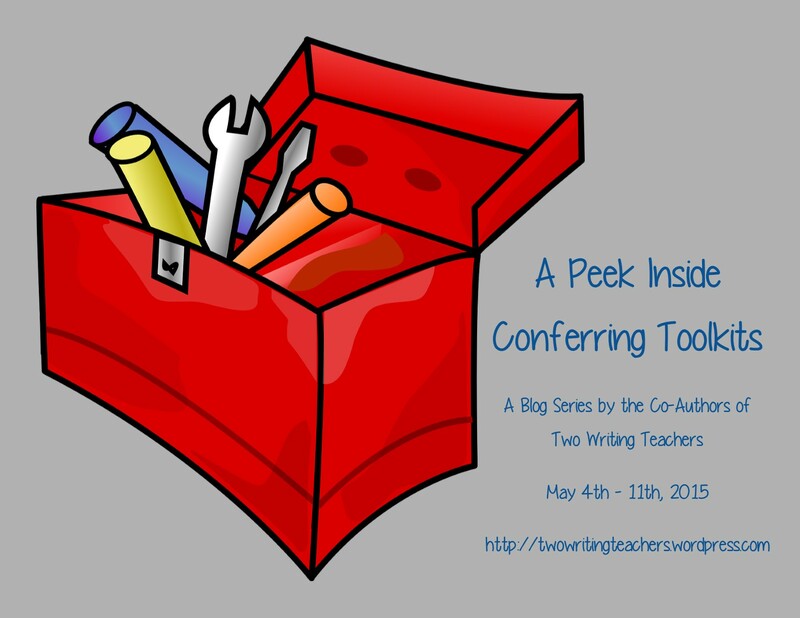 I believe conferring notes are one of the most important things you can keep in your conferring toolkit. 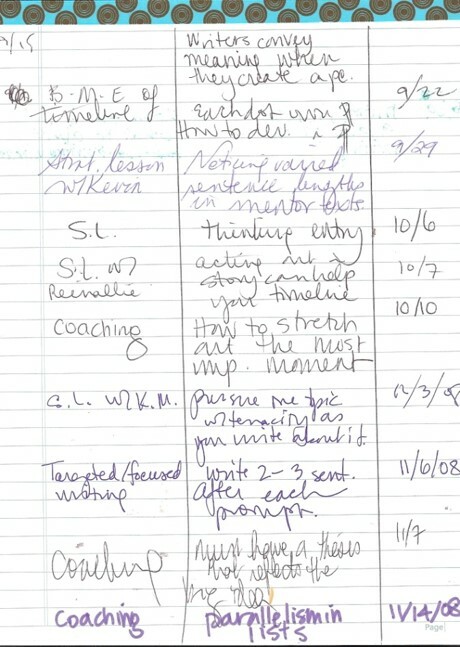 It doesn’t matter if they’re scrawled on paper or are typed on a tablet that resides in your conferring toolkit. 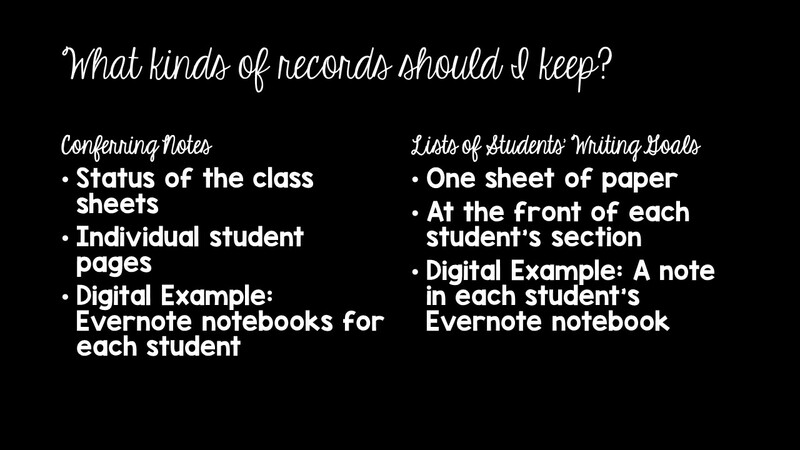 All that matters is that the records you keep will help you to better understand your students as writers. 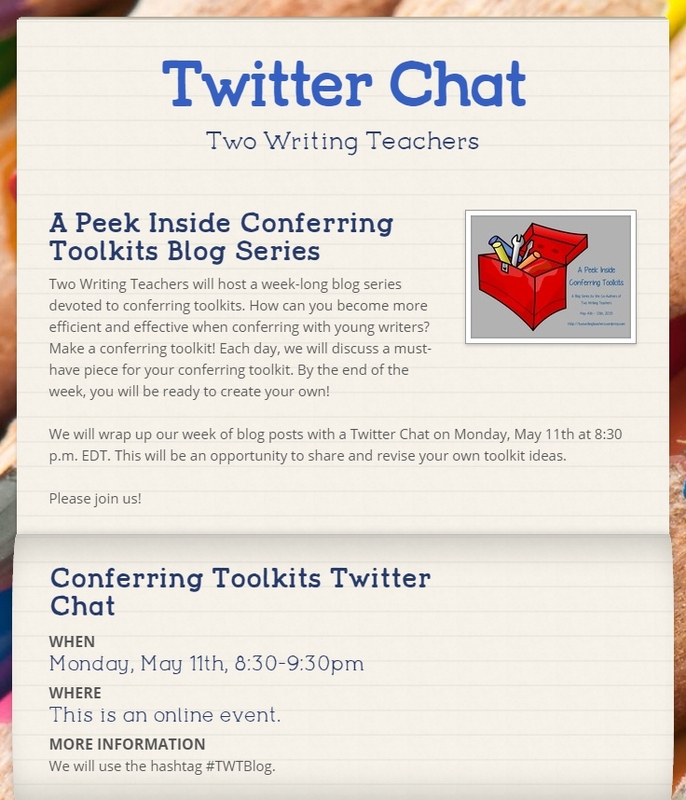 Let’s chat on Monday, May 11th at 8:30 p.m. EDT, when the six of us host a Twitter Chat about conferring toolkits. Just search and tag #TWTBlog to participate. Click on the image for more information about the Twitter Chat. NOTE: KustomNote has now changed its name to Transpose (http://transpose.com/). Here’s more info: http://www.geekwire.com/2015/kustomnote-rebrands-as-transpose-raises-1-5m-for-holistic-information-management-platform/. I learned a lot from your post. I think I will try taking Evernote to the next level with KustomNote! My summer project is going to be digging back into Evernote because I think KustomNote templates will fit my needs. Do I need to be “online” to get to the template to record notes? Access in some buildings really varies. I love how you have “pre-set” where your notes go. I find that pre-planning (even with my photo backups) saves so much time and worrying about whether I did or did not or even “where did they go?” type questions. I will tell you, Fran, that is the downside of KustomNote. I always have to make sure I have wifi if I want my notes to transfer to Evernote. (Which turned me into quite a pain in the tush with the front offices of two schools I went to this year since their wifi password was always changing.) Anytime I couldn’t access the wifi, I just jumped right into Evernote and used Evernote by itself, which is another option since you don’t have to be online to use Evernote. Hope that helps! Thanks for that “workaround”, Stacey! Google docs only work with wifi as well which is fine when working, but when not . . . . GRRR! I use notability app to collect notes and photograph work samples. It takes getting used to but I like it. I’ve seen other teachers use Notability and they love it. I think it has similar functionality to Evernote, right? Yes very similar. I use Evernote for note taking at professional development. I like it because I can open it up and log in anywhere. I like using notability to put my rubrics and checklists in and I can use the pen function to write notes directly on top of the rubric or put a check mark. I use the Confer app, available on both iOS & Android platforms. It’s a pricy app, but allows my colleagues & I to share classes, so as we co-teach we can each confer & both of us have all the data. 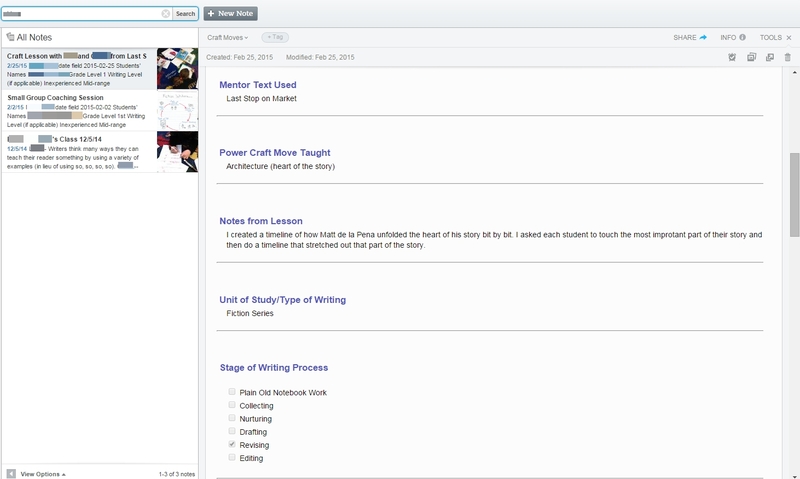 You can sort students in a variety of ways, including by goals/teaching points, form groups, take photos of student work and customize fields. 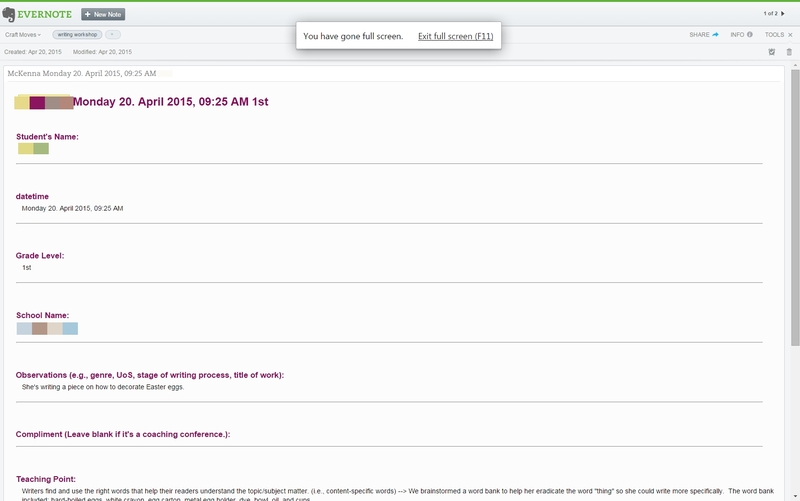 You can easily generate a bank of comments and go from there. While I wish you could access the information on a desktop or laptop computer, it’s a great conferring app. That’s great that you can share the data with your colleagues. I didn’t realize you could form groups using Confer. Do KustomNote and Evernote sync with each other? If you create a note in KustomNote will it also appear in Evernote? Yes. KustomNote synchs seamlessly over to Evernote. Once your note appears in Evernote you can make any changes (e.g., add photos or audio recordings) to the note. Those changes, however, won’t appear back in KustomNote. KustomNote is basically a template/form creator, as where Evernote is the place where you’ll store everything. LMK if you have additional questions. I use the app Confer, however, after reading this blog, I think I will look closely at Evernote/ KustomNote! Thank you! I tried Confer right after it came out and abandoned it. I’m not sure if and how it’s been updated, but I know lots of people like it. However, for me, Evernote has been the most useful tool since it syncs across platforms.